Posted September 19, 2018 by admin & filed under Car Repair. The vast majority of cars on the road today will experience some form of oil loss at some point during their lifespan. More often than not, it’s just usually minor dripping and smaller leaks that are preventable but, sometimes, more significant oil leaks occur which require the attention of an experienced mechanic. Most commonly, improperly-sealed drain bolts are the cause of a small oil leak. When having an oil change performed, your oil pan is drained and then resealed, often with a new washer being fastened around the drain bolt. Cheap “quickie lube” oil change services may not include a new washer, which may result in new leaks after the service is performed. If you notice a leak shortly after having an oil change done and it persists for a couple of days, there’s a good chance you could need a new washer. Small oil leaks are also common in older vehicles because of mechanical motion as well as dramatic temperature fluctuations that occur within combustion engines. Frequently checking oil levels is important. If the oil stains pavement, kitty litter or crushed drywall will absorb the oil. In a worst-case scenario, oil loss will seemingly come out of nowhere. Most modern vehicles come equipped with tools that notify drivers when oil pressure drops, usually in the form of a light or computer-based alert. When you receive a notification like this, you should stop driving ASAP since friction from oil loss can damage vital motor components and potentially lead to engine failure. 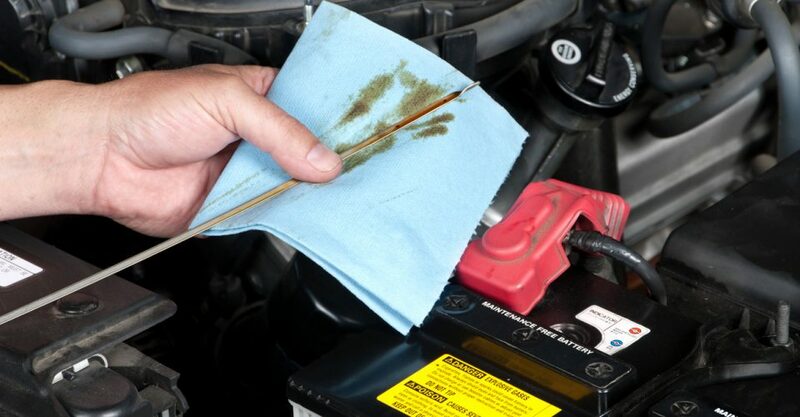 Abnormal oil loss without any indication such as oil stains or an oily engine may indicate a much deeper problem. This could be a signal that oil is being burnt internally or possibly seeping past the pistons into the combustion chamber. A broken head gasket could also be in pay. These problems are quite serious and will lead to reduced fuel efficiency as well as power loss issues for your vehicle. If you think you might be losing oil, bring your vehicle to an ASE-Certified Technician who will diagnose the problem and will offer solutions based on the nature and severity of the oil leak. Click HERE to schedule an appointment with our auto care specialists or give us a call at 616-796-9929 any time you have a question regarding your vehicle’s health!